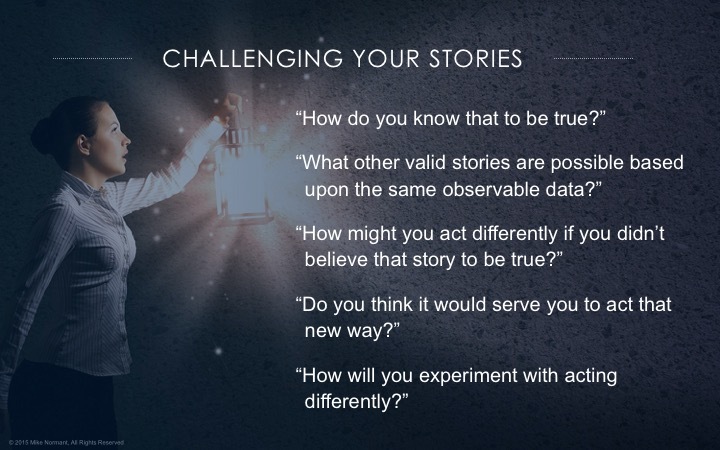 In today’s post (Challenging Your Stories, Part II of II), I’ll provide an example of using the approach that I shared in last month’s blog (Part I). In last month’s blog, I highlighted that we each “climb” our own unique Ladder of Inference (inside our heads) which is how we generate our stories (i.e., assumptions, conclusions, beliefs, etc.). This happens so seamlessly that we tend to operate as if our stories are facts, or what I call capital T Truth. In fact, these stories are our truth, with a small t.
I assume you can relate to this one. You’ve sent an email to somebody (Jack) and did not receive a response. Based on this you know that Jack is mad at you. It’s the Truth. Hence, you act accordingly. You start to avoid Jack in order to ensure you don’t have an unpleasant encounter. After all, he is mad at you. I hope you can see how powerful these questions can be. You can imagine that this self-talk “conversation” only takes a few minutes. Of course, it is not always this easy…but often it is! Let’s look at this situation from a more distanced viewpoint. You were stuck on some things due to the situation with Jack. If asked why you were stuck you would be likely to say something like “It’s pretty hard to make any progress when Jack is mad at me.” As we’ve shown, it was NOT Jack being mad at you that had you stuck; It was your story that Jack was mad at you that was getting in your way. Think about your own current situation. Where do you have assumptions (stories) at play that may be blocking your forward progress? Try challenging one of these stories using the five questions above and see what action / next step emerges to propel you forward.